Back again, with some more Valkyrie server goodness. The above video is our guild taking out the 5 Atroce spawns. While we were a bit rough on our first attempt, you'll see that each run was notably smoother and faster than the one before it. It simply goes to show that you don't have to be particularly well equipped as long as you're smart about what you do. 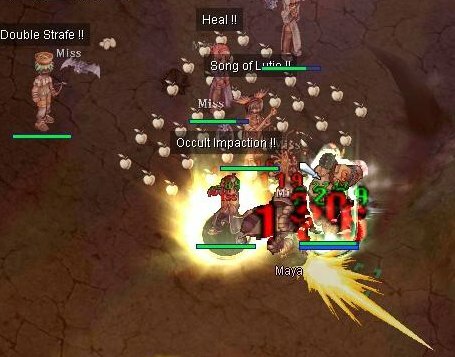 Atroce is no pushover, and to take him out easily at this point since Valkyrie server opening is nothing short of impressive. 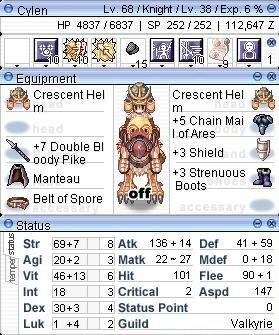 Behold, the gear of a true Atroce tank. Not quite optimal for the job, but I'm sure you see in the video that aside from our first attempt, Atroce very rarely ever landed a blow. 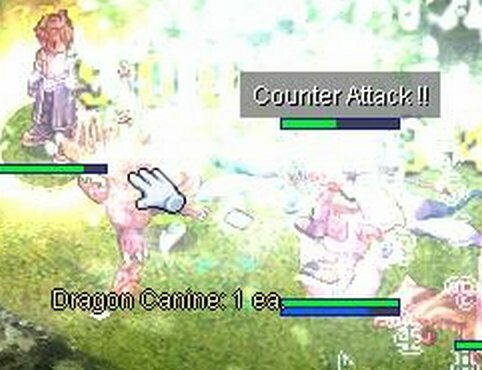 Counter Attack turned out to be more useful than expected, since attacks that are countered do not count towards safety wall hits, making walls last longer. The Flamberge is just a store bought weapon. I got it since it was the strongest attack power 1h sword that was easily available. A spear would work but counter relies on ASPD so a fast hitting weapon is important. In retrospect I should probably have bought a dagger, but the sword is nearly as good. As you can see from the previous shot, I've been getting some levels. 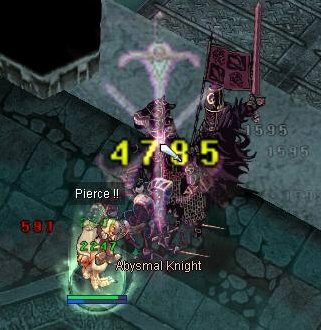 Generally my in game time has been spent somewhere on gear hunting and efficient leveling, and while there is usually very little overlap, some places like Glast Heim Chivalry 2F can be fairly good for both. The Ahlspeiss, the two handed spear that we have in guild is an amazing spear that can bypass defense. You can see here that it can deal pretty decent damage on targets normally highly resistant to physical damage. We didn't get any cards from chiv yet though. This is unfortunately my reaction as well when seeing another player at Thara Frogs. 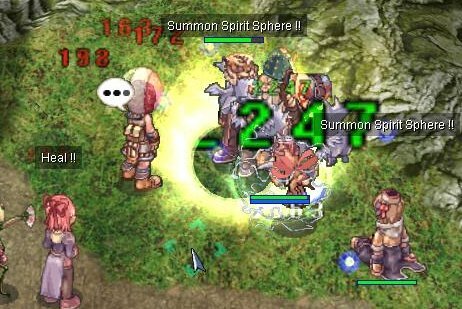 The GMs have generally had a very good response time for taking care of bots, which is why I'm generally a bit confused as to why bots are suddenly running wild. Maybe its cause some of their staff is in the Philippines for RWC? Not really sure. Nothing special, just thought it was a kind of cool shot. Counter Attack owns though! Same party, one level down, against the real Maya. Now that we have a buckler of gargantua in guild, Maya is no longer able to kill me with her powered up brandish spear, generally making hunting her much safer for everyone. Improvements in skill, level and gears are winding down the party size needed to do some of the weaker MVPs, such as moonlight flower. Tolrin is giving her a good hit in this shot. I missed shotting the item on the ground, but we found one of these while on the way down to kill her. Lucky! Most would consider drake a worthless boss, but between Cutlus, Saber and Haedongun, these are items that players at this point in the game really need, so we've been making a note of killing him. 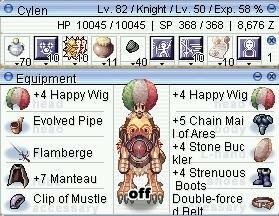 Once we got a wind armor, mistress instantly became the easiest boss on earth. Well, that's not entirely true, as only certain players are effective at killing her, but we were sure to bring those along. The real battle however, is finding her, which is much more annoying when you have 4 people waiting for you to find it. Osiris was a little harder than expected. I think it simply came down to being unprepared... the fight got off to a real bad start when I got JT'd trying to pull it and the boss was never on me the entire time until people started dying. I would have had a victory shot but Tychon ignored us and tried to kill it on his own. An unusual place to find such a monster. Hydrolancer is known for its fairly good drops, so we took the time to try to kill it. Hydrolancer isn't exactly an easy monster though. So yeah, we found a Hydrolancer card on our very first kill. 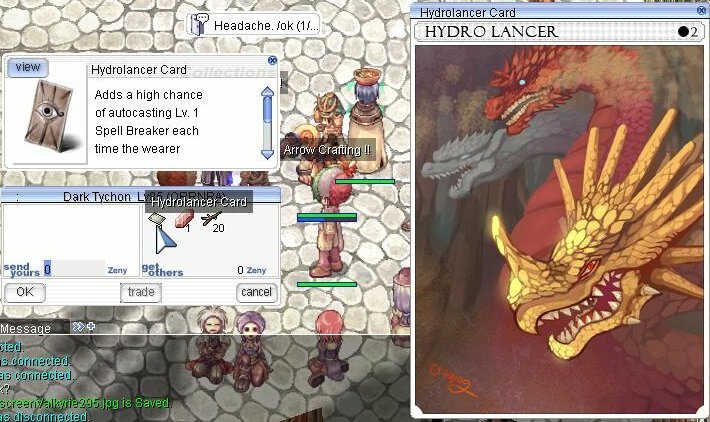 I'm amazed at our luck, but at the same time I'm disappointed because Hydrolancer card, while very rare, isn't really that good. The card slots into a weapon, and gives a 10% chance to cast spell breaker level 1 when attacking an enemy. While it sounds reasonable, spell breaker is really a skill that requires timing to use, and an autocast card is anything but reliable. 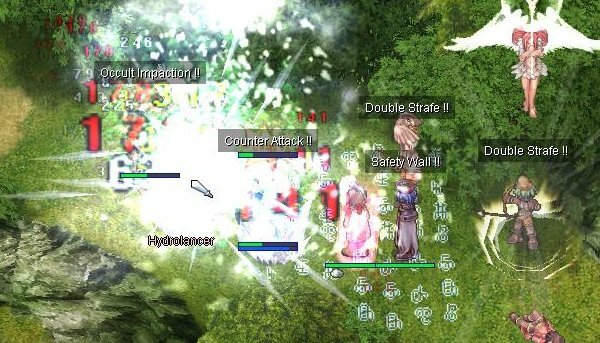 In woe players rarely are using skills that are uninterruptable, and spell breaker doesn't work very well on boss monsters... which really gives a limited selection of targets that its useful with. We might just keep it as a trophy. You didn't honestly expect us to take long to get into the MVP scene did you? 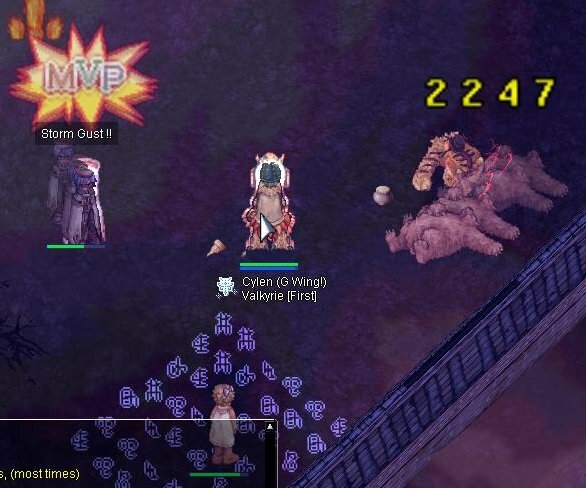 Even in the relatively ungeared and under leveled scene that is the Valkyrie server, many MVPs are still possible, though they take a little more work than one would normally need to beat them. I apologize for the crappy maya portion of the video, I will put in a new final segment if I get some new footage. Overall all the MVPs were fairly simple. 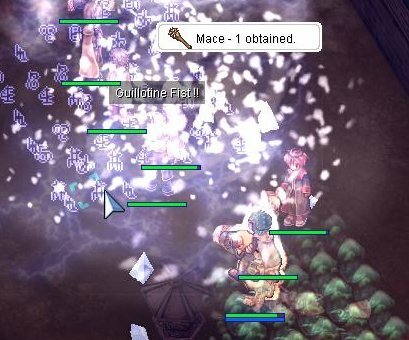 The gears I have aren't exactly optimal, so I made use of assumptio scrolls. Honestly I save two monthly subscriptions worth by playing on the free server now... but I never intended to take that money out of RO. The free server model is easier to pay for I think because you get tangible benefits for paying, so I don't feel bad about using scrolls on something like this. Its probably required without a mental strength tank, which we're lacking at the moment. Phreeoni isn't all that tough. He does still hurt in power up though, which is why I still made use of assumptio. Main concern is stone curse. Its harder to deal with when no one can resist it, and none of the casters can hold a monster to break stone because no one has phens. Our first attempt was pretty rough, but once we started having people off screen it wasn't bad. Realistically this only takes 3 people with our current gear, but we don't want to leave our guildies out of the fun. 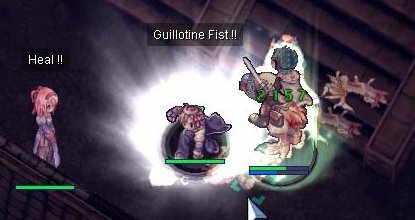 Moonlight Flower is a bit angry in melee combat, so we made a very visible effort not to tank it when we could. She basically forces us to do it anyways, because her constant use of magnetic earth requires you to keep moving. We've done moonlight twice so far, and no major casualties yet. Our first decent MVP loot. Orc Hero is pretty hard. Luckily our guild has a cranial guard that I use for this, or it would probably not be possible. Tanking it isn't so bad, as long as pneuma is kept up. Problem comes with power up. His earth element attack is what kills me in the video, and each of the three times we've done I've died to it. Actually main issue is when they blast him with SG like that I can't see his power up until its too late to move. 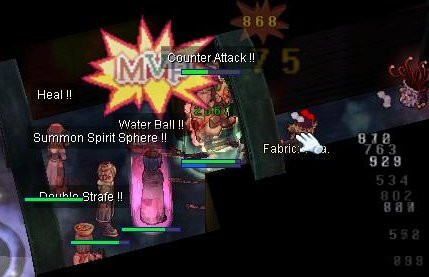 I'm contemplating getting more earth resistance via a hode garment or fire element armor to prevent this one shot problem, which would make this another easy MVP. The last MVP featured in the video is Maya. Her slaves move independently of her, and as you can see from our first encounter if you don't control it properly the minions run free and will kill everyone except the tank. Physically the arclouse deal more damage than maya herself. Again like the other MVPs we fought Maya becomes tricky when she powers up. 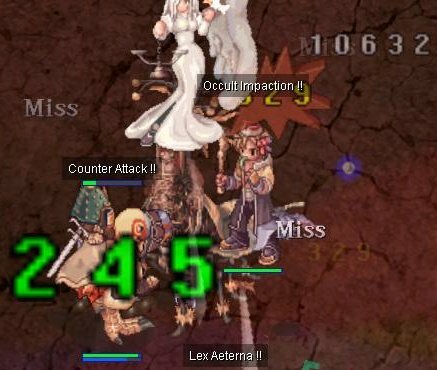 Her brandish Spear struck me for 12k before. If I manage to find the brandish blind spot (a place you can stand where brandish spear will miss), then its not so hard to tank, but I can't seem to reliably figure it out. Maybe later we'll do this MVP more frequently. Eddga isn't in the video, since we've only got to do him once, and that was in GD. We basically did what we did with Moonlight Flower, keep moving, don't stand in one spot for too long, and eventually it falls over. These are my MVP tanking gears, nothing short of epic eh? Just a short video I made durring testing on the Philippines RO test server for episode 12 (don't ask). While I'm not the best geared in this video, I wasn't expecting what ended up happening. Harder than expected! 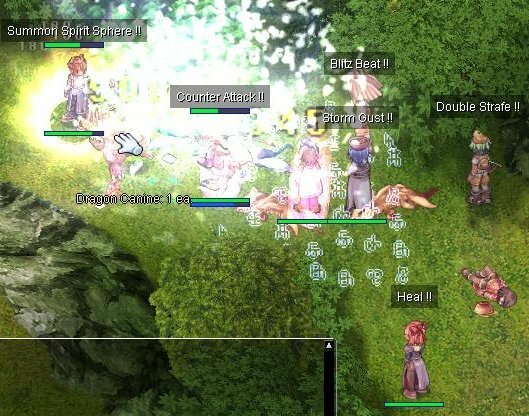 This is our second attempt at a guild 'No-Trap' Valkyrie Randgris event. While our best run yet, it was not without mistakes. I've been told the video here paints a pretty picture of what happened, so for those who want to see the full story, I created an uncut/unedited version using all of my recorded footage. Dubbed the 'ichigo' version, after his monstrously under-edited 25 minute woe videos, this might be as uninteresting as it is long, but some might enjoy it. Anyways the run was alright. Some very basic mistakes probably kept it from being a solid run. Two of our three high priests realized after they were wearing the wrong shield, we ran out of bombs halfway through causing us to disband temporarily, and our champion (a low str woe build no less) had this deep down obsession with killing one of her minions (a good idea), and obsession that apparently never ended even after we did kill one of them (a very bad idea). Probably my mistake, but my armor chemical protection ended leaving me with a broken holy odin blessing... again resulting in another trip to town. Still, it was faster than our last run and resulted in fewer wipes. To address what occurs in the video specifically, tanking it with the LK was the way to go. The guild has acquired an angeling odin blessing, which means LK tank is fully possible now. I had overlooked the fact that sacrifice would break at each of her dispels, but combined with strings our paladin had no trouble recasting (when he remembered). I'm not entirely sure why we died to the first earthquake. The fact that some party members were not equipped with the correct reduction gear was probably not helping, but in the end we simply went with the assumption that the lack of assumptio on some members caused the wipe. After we stressed re-assumptio'ing players things went a bit smoother for future earthquakes. The reason why I attempted to flee was that as the clock quickly approached the 25 second mark since her last earthquake, with everyone still dead I felt we couldn't take another earthquake and wanted to get Randgris away from the party. After all at that point my odin blessing had just broken (it just broke after the EQ that killed everyone), and I doubt I could tank her power upped attacks without it. I was partially right, because her holy cross murdered me, but unfortunately I didn't get it far enough away. So there it is. I'm contemplating organizing our Beelzebub second attempt sometime in the near future. I've heard rumors that the Exile skill is a forced-ranged attack and potentially block-able by pneuma at any range like clashing spiral is now. Unfortunately to date I've been unable to test it. If its true it could make Beelzebub quite a bit easier... its been something I wanted to know before attempting him.